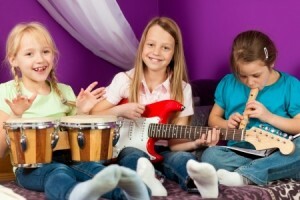 Children are known to have fleeting interests; an interest in music is sometimes no different. However, research has found there are many benefits to learning to play an instrument as a child. Now another study indicates that, even if musical instruction only lasts a short time during childhood, the brain may reap some serious benefits later on in life. According to the Northwestern University researchers who conducted the study, playing a musical instrument actually changes the anatomy and function of the brain. However, researchers said they weren’t sure if this had a lasting effect if musical training stopped. This is what they set out to determine with their study, which was published in The Journal of Neuroscience. A total of 144 adults were included in the study. Some of them had previously received musical training around the age of 9, while others had received no training at all. All of them listened to synthesized speech syllables while researchers measured and recorded the activity in the auditory brainstem. Previous studies have shown that, as a person ages, the brain may change and actually compromise hearing and ability to interpret speech. However, this isn’t necessarily an inevitable change; studies done on musicians have found that lifelong musical training can delay or even offset these declines in cognitive abilities. But even if training does not continue, it seems that music has a lasting effect on the way the brain functions. According to the recent Northwestern University study, participants who received between 4 and 14 years of musical during childhood had a faster response time to speech sound than those that had not received at least 4 years of music training. The difference was small – only about a millisecond – but that difference could be accumulative, which could make a pretty substantial difference even later in life. Plus, more time studying music as a child led to faster brain response time to speech as an adult. All in all, the study suggests that, parents and schools should encourage musical training in children, even if it is just a fleeting interest.